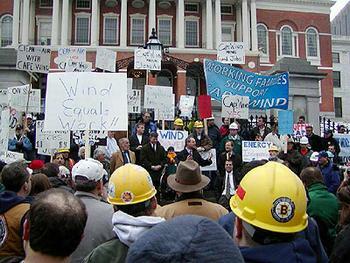 BOSTON, Massachusetts, September 1, 2010 (ENS) – The Massachusetts Supreme Judicial Court ruled in favor of wind farm developer Cape Wind Associates on Tuesday, rejecting the appeal of a permit the state has granted for transmission lines needed to carry power generated by the wind farm. The six-member panel of the state’s highest court decided 4-2 that the transmission lines to link Cape Wind to the region’s electric grid could go ahead, but the two dissenting justices warned of a negative impact on local communities. Marshall, who was joined by Justice Francis Spina in the dissenting opinion, drew a parallel with the BP Gulf of Mexico oil spill, writing that failure to consider the “in-state” consequences of a project in federal waters could have catastrophic effects on state tidelands and coastal areas. The Alliance to Protect Nantucket Sound, the Cape Cod Commission and the town of Barnstable had appealed the Massachusetts Energy Facilities Siting Board’s 2009 approval of the two transmission lines, and they vowed Tuesday to continue their fight against the wind farm. “However, despite the ruling, the tide has clearly turned against Cape Wind over the high cost of this project. Residents and business owners know this project would bankrupt the Commonwealth,” the Alliance said. But Cape Wind expressed confidence that the ruling cleared its way at the state level, although the U.S. Army Corps of Engineers must still grant the company a permit before it can construct 130 wind turbines over a 25-mile stretch in Nantucket Sound. “The SJC’s decision brings to a close 10 years of state and local permitting for this landmark clean energy project,” said David Rosenzweig, Cape Wind’s attorney in these proceedings. “This important decision brings Cape Wind’s benefits of hundreds of new jobs, greater energy independence and a healthier environment that much closer to the people of Massachusetts. The court was right to say no to the delay tactics of the oil and coal-funded opposition group which brought this lawsuit,” said Mark Rodgers, Cape Wind communications director. Cape Wind says it can generate power by the end of 2012 and will be able to supply about three-quarters of the power used by the 225,000 residents of Cape Cod. The court ruling brings to a close the state permitting process and attention now turns to the federal government. The Federal Aviation Administration has upheld and finalized its May 17 Determination of No Hazard on the part of Cape Wind by its Denial of Petitions for Discretionary Review that were filed by project opponents. Cape Wind has also cleared its navigation reviews with the FAA and with the U.S. Coast Guard. Cape Wind’s amended long term Power Purchase Agreement with National Grid has been found to be in the public interest by Massachusetts Attorney General Martha Coakley who has recommended that it be approved by the Massachusetts Department of Public Utilities. In April, U.S. Secretary of the Interior Ken Salazar announced his approval of Cape Wind with a favorable Record of Decision for the project to be constructed and the project has long had the support of Massachusetts Governor Patrick Deval.